On the other hand, the exhibition of Arsennale fills my head with words such as “destroy”, “development”, “chaos”, “religion”, “dispute.” Then, these words, echoed in my head, connect to “life and death” in the end. If I described the work at Italian Pavilion as 20th Century contemporary art from mainly the U.S., the work at Arsennale is contemporary art with more global perspective including the diversity of the artists. Leon Ferrari, whose paintings were also exhibited in “Documenta12,” had a great exhibition with drawing, collage and installation space consisting of sculpture with his best-known work of Christ crucifying on a fighter plane, which was canceled to show in the exhibition in Buenos Aires in 2005 because it was too radical. There was no doubt that he received the Golden Lion, which is the highest prize at the 52nd Venice Biennale. Gabriele Basilico. Beirut, 1991. 9 fotografie / 9 pictures. Pure pigmented print. The photographs of Yto Barrada and Gabriele Basilico have high degree of perfection as usual, showing the “ruins,” which human creates unconsciously, from different perspectives. However, other photographs are more like documentary photography which shows dispute and misery of modern society. It makes me think what “photography as art form” is. Also, the exhibition itself falls into a slump. 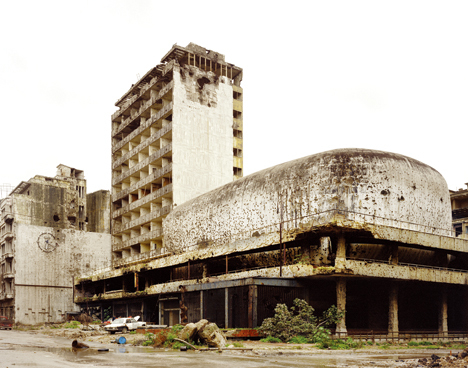 In the slump, we come across Paolo Canevari’s video “Bouncing Skull.” In the video, a boy is playing with a dirty ball in front of the ruins of Belgrade which are half destroyed by a bomb. But, if you watched it carefully, the thing you thought was a ball was a human skull. A boy is kicking, catching, rolling, and stamping the skull alone and intensely as if he is haunted by something. One country in each screen, it is a simple video that people say “I will die” in their native language in front of the camera which the artist held in ten different countries. Some American said the phrase and acted from the beginning to the end with smile as if it was a play. On the other hand, some Asians looked at the depth of the camera, as if they were staring fixedly at the depth of the viewer’s minds, and said the phrase. Some Japanese showed the uncomfortable behavior taking their eyes off from the camera after they said the phrase, and faced the word in the bottom of their hearts. Jan Christiaan Braun. Happy Together: New York & The Other World, #45. 2006. 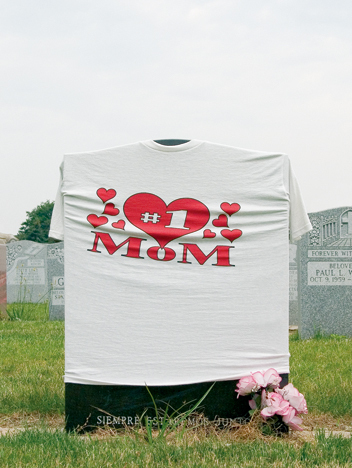 Right next to the video installation, there were photographs by Jan Christian Braun of graves in the U.S. cemeteries that have been highly decorated for Mother’s Day, Father’s Day, Halloween and Valentines Day as if people hoped their dead family member enjoyed the holidays together. Both the decoration and the color of the photographs are grotesque, but at the same time, it seemed childish and innocent. The photographs conveyed the deep feeling of living people about their dead close relatives. Above the work which looks for the beauty of modeling, such as the work of Franz West and Tatiana Trouvé, Francis Alys’s “Bolero” was the most wonderful piece which let us sigh for the beauty. It consists of five-hundred eleven drawings and the animation of shoe-shining which is created by these drawings, and repeats with different executions for 9 minutes 22 seconds. As the video of shoe-shining shows a moment of life, the different moments from five-hundred eleven drawings on tracing papers also show a moment of life.